It would be easy to pan this film... maybe too easy. At first glance director Shirley Clarke’s 1987 film Ornette: Made In America is willfully confusing in its originality. If you are expecting a straightforward documentary portrait about a pioneering Free Jazz musician you will be disappointed. Ornette has now been restored and released on both DVD and Blu-ray by Milestone Films. Subtitled “Project Shirley Volume Three,” Ornette is part of a larger work Milestone is doing that will encompass the work of the unique filmmaker Clarke. It may be a somewhat difficult film to watch, nevertheless I think it deserves an audience. Let me explain why. In any experimental art there is a thin line between challenging the audience and simply annoying them. For me a line is drawn when the artist indicates their intention up front. Clarke does not do that in Ornette, but instead opens the film with a scene of a modern city street full of white men dressed for the 19th century and shooting each other... perhaps a day like any other in the Wild West town of Fort Worth, Texas? This segues into a 1983 ceremony honoring Ornette Colman as a favorite son of Fort Worth, where he is now being given the key to the city. It seems the prodigal Fort Worth is returning to its son. This is followed by a scene of a small black boy wandering along the railroad tracks. OK, that is supposed to be the young Ornette and we are no doubt going to see some reenactment of his youth growing up hardscrabble in racist Texas. But no, we cut back to the premiere of a Coleman composition that is being played by the Fort Worth Symphony... a sort of concerto for jazz band. More cuts back to the young boy follow. A man (not Coleman) looks at a house (maybe Coleman’s birthplace?) then a title and credits appear, then more symphony... and so it goes. At one point Coleman’s wife, Jayne Cortez, says that his music left people “puzzled, confused and embarrassed” and I’m thinking that is where I am with this film too. It seemed to me not only were there pieces missing from this puzzle, but that there were pieces there from other puzzles as well. But I found it hard to believe that this film was really as bad as it looked and I was reminded of Samuel Clemens’ observation that, he had it on good authority Wagner’s music was not as bad as it sounds. Clemens’ sly comment is about his deficit in comprehension. What was I missing in Clarke’s film? I think the key to this film can be found in the moment when Coleman says that he always strives to “... first do something original.” Director Shirley Clarke certainly did that in Ornette: Made In America and the conclusion I came to was that Clarke had not made a documentary about Ornette Coleman but rather had made a portrait of Coleman in the manner of his Free Jazz music which is dissonant, abrupt, angular and often aggressive. Coleman’s jazz cuts rapidly from one musical line to another or sometimes has no coherent tune at all. 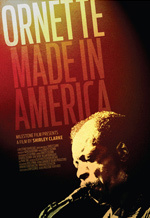 Seen in the light of being a “jazz film” Ornette: Made in America makes a lot more sense. And indeed on second viewing the film does bop along to its own frantic logic. Clarke has really done something very original here just as Ornette has advised. When this film is integrated into Milestone’s Project Shirley package, I think it will be easier to understand as a work of filmmaking that is also a wonderfully outside-the-box documentary.